A fabulous example of a globular cluster, Omega Centauri is in the vicinity of the Southern Cross and hence visible at most times of the year in southern skies. Though seemingly just another star to the naked eye, binoculars reveal an obvious puff ball of many stars. The cluster is thought to contain several million stars within it and has been proposed to be the remnants of a dwarf galaxy which as swallowed up by the Milky Way. More information about Omega Centauri is here. The Pleiades are an open cluster of stars, near the celestial equator and hence visible in the northern and southern skies. The subject of mythology in many cultures. They were called the Seven Sisters in Greek mythology and Mankamankarrana (a group of young women) by Indigenous Australians. In a more modern context, they are called Subaru in Japan and are the basis of that car make’s logo. The Pleiades are commonly visible in the late evening summer skies,to the west of Orion’s Belt (see here). More information (about the Pleiades, not the car) is here. For a southern sky equivalent, visible all year round, try the Southern Pleiades, in the Carina constellation and not far from the Southern Cross (see here). Not nearly as culturally significant, this dimmer group is a bit lost against the backdrop of the Milky Way, but a certain similarity is apparent with the real Pleiades when viewed through binoculars. More information about the Southern Pleiades is here. Red giant stars are easily visible as red through binoculars, but (like Mars) less so by the naked eye, unless your eyes are fully dark adapted. Hence, binoculars offer a quick introduction to stellar lifecycles, where gas clouds (like the Orion nebula) are your stellar nurseries, blue stars (like the Pleiades) are juveniles and red giants are senior citizens. Arcturus is the brightest of the three, being only 37 light years away, and appears in late evenings skies of winter. Its mass is probably not much more than our Sun, but it is 25 times bigger due to its old age. However, although further away and dimmer, Antares andBetelguese are on a whole different scale—red supergiants. Betelguese is 650 times, and Antares, 700 times bigger than the Sun. Both are candidates for ending their lives as supernovae, Betelguese may be first, perhaps in the next 1,000 years—and being 430 light years away this could already have happened. More information about Arcturus here, Antares here and Betelguese here. This webpage (scroll down to pictures) gives a nice demonstration of the relative size of other stars compared to the Sun. Visible in the late evening winter southern skies, the 2 star clusters M6 and M7 can be captured in a single field of view in your binoculars. 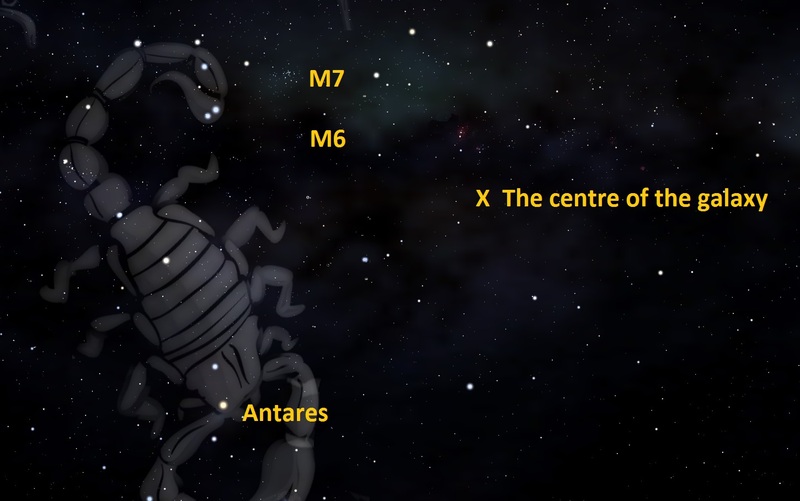 From there it is an easy matter to visualise the centre of the Milky Way galaxy as the third point of a triangle (see star map of the Scorpio region). The location itself is unremarkable, with the centre obscured by thick clouds of dust, so it’s just a nice to know position in the sky. Great pictures of the centre of the galaxy can be seen in infra-red, for example through the Spitzer telescope.